The apostles Peter, James, and John appear before Dante in the sphere of the twelve constellations of the zodiac (known in Ptolemaic astronomy as the "fixed stars"), where they test the celestial traveler on the three theological virtues: Peter on faith (canto 24), James on hope (canto 25), John on love (canto 26). Peter, who famously denied knowing Jesus three times before the rooster crowed (Matt. 26:33-5; 26:69-75), first whirls around Beatrice three times (24.22-3) and then around Dante three times (24.152-3), and his final speech contains a three-fold denunciation--in the harshest terms--of the current pope, Boniface VIII (27.22-7). Despite Peter's cowardice--not to mention his temper (he hacked off the ear of the high priest's servant: John 18:10)--he is entrusted with the keys of the kingdom of heaven (Matt. 16:19), and thus serves as the first Bishop of Rome (in effect, the first pope). His name-- Petrus--was interpreted to mean "rock" (petra), that is, the "foundation" of the Church (Matt. 16:18). Biblical commentators associated James, brother of the apostle John and thought to be the author of a biblical epistle, with the virtue of hope, the topic of Dante's second examination. According to tradition, James taught the Christian gospels in Spain; after he died as a martyr in Jerusalem, his body was brought to Santiago de Campostela in Galicia (northwest Spain), which later became a favorite pilgrimage destination (after Jerusalem and Rome) in the Middle Ages. John, the disciple most loved by Jesus (who, on the cross, told John to look after Mary: John 19:26-7), was believed in Dante's time to be the author of both the fourth gospel ("In the beginning was the Word, and the Word was with God") and the Book of Revelation (Apocalypse), the final book of the Christian Bible. Dante uses his encounter with John to lay to rest the idea that this apostle's body ascended to heaven along with his soul, a privilege granted only to Mary and Jesus (25.118-29). Peter, James, and John perhaps appear together here in Dante's paradise because they were alone with Jesus at dramatic moments--as when they imagined seeing a "transfigured" Jesus together with Moses and the prophet Elijah (Matt. 17:1-8). Dante's three sons were named after these apostles. 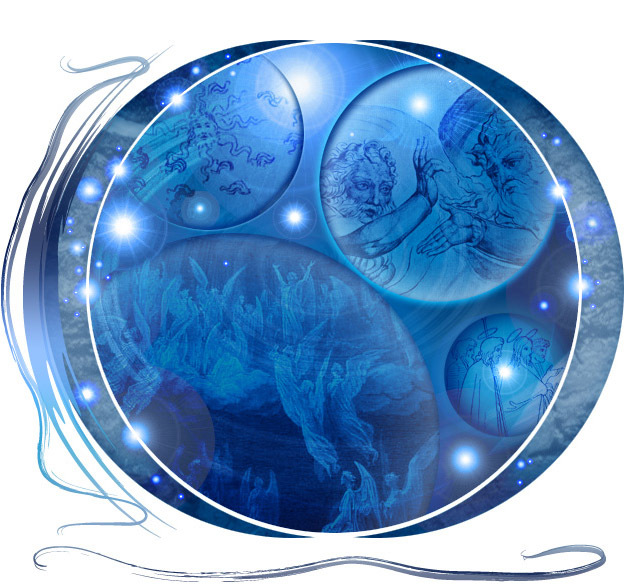 The soul of Adam, the first man created, joins the three apostles--including the first pope (Peter)--surrounding Dante and Beatrice in the sphere of the fixed stars: specifically, in the constellation of Gemini, Dante's birth stars. Adam's creation and life in the earthly paradise (Eden) are recounted in Genesis (2:7 to 5:5): he is made of the "slime of the earth" and endowed with a living soul, and then given free reign in the "paradise of pleasure" with the warning not to eat of the tree of knowledge of good and evil; Adam names the creatures of the earth and is given a female companion (fashioned by God from Adam's rib); deceived by the serpent, Eve eats the forbidden fruit, as does Adam, for which they lose their innocence and are cast out of paradise to live out their days. Adam articulates the four questions on Dante's mind (26.109-14): 1) when Adam was created (and placed in Eden), that is, how old he is; 2) how long he was allowed to enjoy Eden; 3) the reason for God's anger; 4) the specific language Adam made and used. Adam quickly, and vaguely, dispatches with the third question: in terms similar to those used by Ulysses in hell, he says that his fault was not that he ate from the forbidden tree but that he was wrong "only for passing beyond the sign" (26.117; see Inf. 26.106-9). He next provides the numbers required to answer the first question, his current "age": having spent 930 years on earth and 4,302 years in Limbo, Adam has passed another 1266 years in heaven (Christ "freed" him from Limbo in the year 34 and the current year is 1300). Adam is therefore 6,498 years old. In his long response to the fourth question, Adam emphasizes the mutability and variability of language: his original tongue was already extinct by the time Nimrod attempted the presumptuous task of constructing a tower to heaven (Genesis 11:1-9), a view in direct contradiction with Dante's earlier theory that humankind shared a single, original language until the construction of the tower of Babel (De vulgari eloquentia 1.6.4-7). The brevity of Adam's final response, to the question of the length of his stay in Eden, is shockingly appropriate: he and Eve lived in paradise for somewhere between six and seven hours. Here, from among the various theological opinions available (one as long as 34 years), Dante chooses the shortest possible time frame for Adam and Eve's fall from innocence. The constellation chosen for Dante's entry into the sphere of the Fixed Stars is Gemini, the stars under which he was born (between May 21 and June 21, 1265) and to whose powers he attributes his talent (Par. 22.112-20). Gemini, meaning "twins," takes its name from the twin brothers, Castor and Pollux. Leda, wife of King Tyndareus of Sparta, was impregnated by Jupiter (in the form of a swan) and gave birth to the twins. Pollux was celebrated as a boxer, while Castor earned renown as a horseman. According to some versions, Pollux, fathered by Jupiter, was immortal but Castor, fathered by Tyndareus, was not, even though both brothers "hatched" from the same egg. When Castor was slain in battle, Pollux pleaded with his divine father that Castor be allowed to share his brother's immortality: Jupiter obliged by placing them in the heavens as the Gemini, the brightest stars of the constellation (Ovid, Fasti 5.699-720). Based on this mythology, Dante refers to the constellation as "Leda's lovely nest" (Par. 27.98). Before Dante proceeds further in his journey, Beatrice instructs him to prepare himself for the celestial joy that lies ahead by looking down at the portion of the universe through which he has already traveled. After smiling at the earth's miserable appearance, he gazes on the seven planetary spheres, from the Moon up to Saturn, which he indicates by mythological family relationships: Latona's daughter (Moon), Maia's son (Mercury), Dione's daughter (Venus), Hyperion's son (Sun), Jupiter's son (Mars), Jupiter himself, and Jupiter's father (Saturn) (Par. 22.139-47). The earth, in contrast to these impressive, wheeling spheres, is no more than a "little threshing-floor" (aiuola) which nonetheless incites humankind's ferocity (Par. 22.151). Dante uses this same word--aiuola ("little threshing-floor")--when he again glances down at the earth, this time toward the end of his stay in Gemini (Par. 27.79-87). Dante's disparaging view of the earth within the grand scheme of the universe has authoritative precedent: both Cicero and Boethius emphasize the earth's paltriness--for Boethius the globe is "but a point in comparison with the extent of the whole heavens"--as a reason for the relatively scant importance of human fame and glory (Dream of Scipio 3.7, 6.1-4; Consolation of Philosophy 2.7). From this second look down, Dante realizes that, as he revolved with the heavens, he completed a quarter of the daily revolution of the stellar sphere around the earth, fixed at the center of the universe. He has therefore spent six hours in Gemini, roughly the same amount of time Adam enjoyed the pleasures of Eden before being cast out (Par. 26.139-42). Now directly over Cadiz, close to the western-most boundary of the Mediterranean Sea, Dante sees, to the west, an expanse of the Atlantic Ocean and, to the east, nearly as far as the shore of Phoenicia, where Jupiter, in the guise of a white bull, abducted the princess Europa. Only this portion of the earth's surface is visible to Dante because the sun lies two signs ahead (further west), beneath the constellation of Aries. Most striking, Dante claims to see the route navigated by Ulysses and his crew as their ship traveled westward through the Mediterranean, out the Strait of Gibraltar into the Atlantic, and then veered south (crossing the equator) before being sunk by a whirlwind originating from a mountain-island somewhere in the southern hemisphere. It is as if Ulysses' ship carved a wound into the surface of the globe, the scar of which is visible to Dante from his perch high in the constellation of Gemini. Insofar as the twins, as stars, became known as the protectors of sailors (Ovid, Fasti 5.720), it is no coincidence that Dante uses his position in this constellation to compare and contrast his journey with Ulysses' voyage. Calling the ship's route a "mad course" (varco folle; Par. 27.82-83), Dante echoes Ulysses' characterization of the voyage as a "mad flight" (folle volo; Inf. 26.125) and reminds us that he initially feared that his own journey to the realms of the afterlife might itself be "folle" (Inf. 2.35). Peter glows red with anger--and the entire sphere takes on this color--as he comments on the low level to which the papacy has sunk. Peter and several of his early successors--Linus (ca. 67-76 or 79), Anacletus (ca. 79-ca. 91), Sixtus I (ca. 115-ca. 125), Pius I (ca. 140-55), Calixtus I (ca. 217-22), and Urban I (222-30)--shed their blood to guide the church not toward the acquisition of wealth but toward the attainment of eternal blessedness (Par. 27.40-45). They didn't want future popes to be divisive figures, with part of the Christian population on the pope's right side (Guelphs) and part on the left side (Ghibellines), nor did they intend for papal power to be used for waging wars on fellow Christians or for selling false privileges and benefices. The popes of Dante's day, in Peter's view, are wolves in shepherds' clothing (Par. 27.55-56; see Matthew 7:15). Following up on his earlier denunciation of Boniface VIII, whom he accused of turning his burial place into a blood-filled sewer (Peter was thought to have been martyred in Rome) (Par. 27.25-26), Peter singles out two French popes who are now preparing to drink the blood of their martyred predecessors (Par. 27.58-60): Clement V (1305-14), the Gascon pope responsible for the "Babylonian captivity" (Circle 8, pouch 3), and John XXII (1316-34), whose reputation for greed well suited the association of Cahors, his native city, with the sin of usury. Peter concludes his denunciation by prophesying the intervention of the same high providence that once helped Rome preserve its glory (when the army, led by Scipio Africanus the Elder, defeated Hannibal in the Second Punic War in 202 BCE) and by exhorting Dante to give voice to the truths that are being revealed to him (Par. 27.61-66). 1. Twice Dante looks back from his position in the stars (Gemini, his birth constellation) at the celestial spheres and the earth below (22.124-54; 27.77-87). What is the significance of these backwards glances, in particular his characterization of the earth as "the little patch that makes us so vicious" (22.151) and the remarkable image of Ulysses' final voyage ("mad course") somehow etched into the earth's surface (27.79-84)? 2. What are possible implications of the fact that the 6 hours Dante spends in his native stars (27.79-81) basically match the short time Adam and Eve lived in innocence in the earthly paradise (26.139-42)? Given that Ulysses and Adam use similar language to describe crucial decisions in their life--Ulysses sailed beyond the markers placed so that "man does not go beyond" (Inf. 26.108-9), Adam was guilty "only for passing beyond the sign" (Par. 26.117)--how do these two figures shed light on one another? 3. Dante meets the first pope (Peter) and the first man (Adam) here in his native stars. Think of other firsts--founding figures, origins--encountered by Dante, particularly in paradise. Why is it appropriate for this theme to grow stronger as Dante approaches the end of his journey?